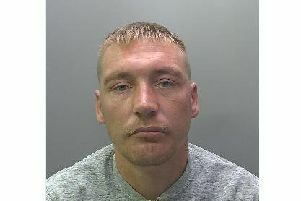 A drink driver who crashed into a garden wall while almost twice the legal limit has been jailed. Jamal Qadeer (22) was arrested after a man reported a car had crashed into his garden wall in Cambridge Avenue, Millfield. Officers found Qadeer in the rear passenger seat of his Ford Focus. He claimed he was not driving and couldn’t remember what happened. But CCTV footage showed Qadeer, who only had a provisional licence, was driving the car and he pleaded guilty to driving under the influence of alcohol and dangerous driving at a hearing in January. Qadeer, of Padholme Road, Eastfield, appeared at Cambridge Crown Court today (Friday, June 29) and was jailed for two months and disqualified from driving for one year and 17 weeks. PC Gary Thompson said: “We will not tolerate drink driving and will prosecute anyone who gets behind the wheel while under the influence of alcohol.